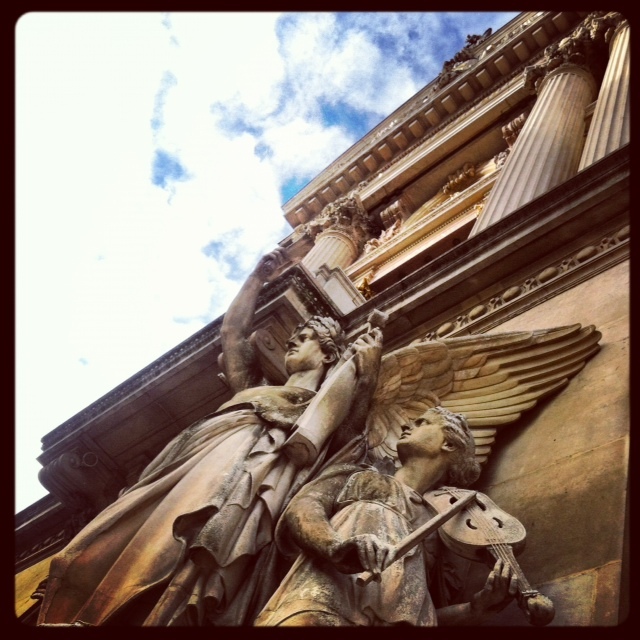 Palais Garnier: 40 Days of Paris, Days 3 and 4 | Parlez-Vous Loco? Why 40 Days of Paris? Find out. PS: there’s also a gallery of pics at the end of this post. Just in case you’re ready for pictoral stimulation now. Fact: I’m an easy crier. Whether I’m sad, happy, stressed, nervous, or in some other extreme situation (or not extreme, for that matter; I’ve even cried at my share of cheesy commercials – don’t judge, people), it’s probably caused a burst of liquid from my eyeballs. Since I moved to Paris, the tears come more freely, I think from—and I’m a little embarrassed to admit this because it sounds super corny—the sheer beauty of things I’ve seen and how lucky I know I am to be seeing them. Standing in front of some of the paintings at the d’Orsay, the Louvre, the Orangerie, sitting on the Seine at sunset, watching the sun come up over the rooftops I can see from outside my window, or rounding a cobble-streeted corner in Montmartre to see yet another beautiful, winding cobblestone street … those things get me every time. I’m that girl. This second one is just a personal thing for me, but I loved standing on the balconies outside, overlooking Avenue de l’Opéra. The Palais Garnier is at the intersection of four streets, all named after composers or liberettists, which basically makes it the heart of Paris. Many might disagree with me there; Avenue de l’Opéra is full of touristy things: money exchanges, visitors bureaus, and oversized tour buses. When I first moved here, I cringed at the sight of it, wishing I’d somehow found a flat in Montmartre or Batignolles or Saint-Germain. The days are flying by. Way too fast. Oh, hi there! How are you?? So nice to see your name on here! Thanks for reading – will do my best to keep ’em coming! Hope you’re well!